Helichrysum, also known as "Immortal" is a rock-star in the world of herbs. I encourage you to look up its benefits for yourself. This oil is very expensive, as it is not easy to obtain. I have combined it with many of my most luxurious and silky oils, to give you a serum that is silky, smooth, and packed with goodness for your skin. This serum helps address signs of over-processed as well as aging skin. Helps soothe redness, reduce the appearance of fine lines and encourage cell renewal. This is a great serum to integrate into your routine. It plays well with others, and should be applied after toner and before moisturizer. 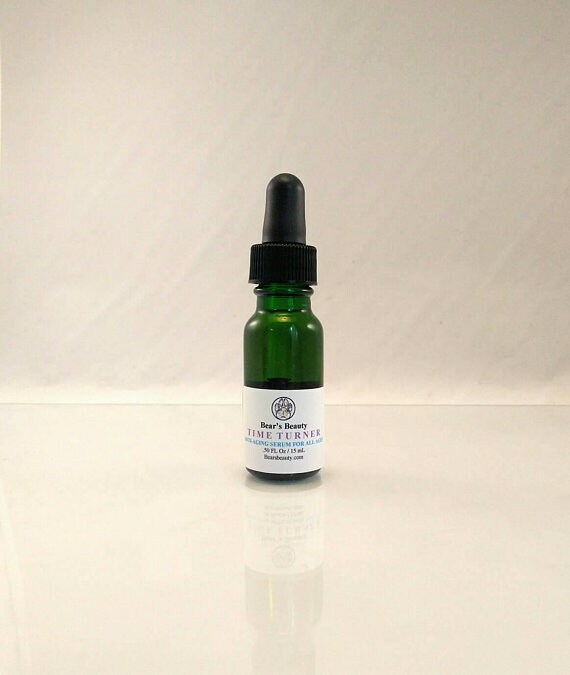 Designed not to clog pores, so no matter your age or skin type you can use this lovely serum. Epic for chest + neck! Use in upward strokes every night from chest to chin and then press a few drops into clean face. A great serum for those who already have signs of aging and those who are just starting to get lines and wrinkles. The name Helichrysum is derived from Greek, roughly translated "Sun Gold." The blossoms of this flower are a lovely yellow hue. This oil is said to help improve the look of aging skin, encourage healing, and reduce the overall appearance of wrinkles and scars. Squalane + Prickly Pear plump and enrich skin with vitamins and amino acids. I also used 50% Organic Hemp Seed Oil, giving you all the benefits of my favorite oil. The green color helps to neutralize redness, as well as soothe irritated skin. Hemp is also high in Linoleic Acid, which helps to soften the gook in clogged pores. Olive Squalane helps cells retain moisture. Initial application provides moisture and skin appears visibly moisturized. Over time, the appearance of fine lines and wrinkles are reduced, skin elasticity is increased, and all signs of aging are less noticeable. Continued application is ideal. Apply 3-5 drops to cleansed skin. I like to use this as my moisturizer after oil cleansing, as well as mix a few drops in with my Cold Cream at night. "I'm hooked on this product! The wonderful feeling it leaves on my skin is divine!" I will say, this serum improved my skin overnight.